This year more than 2,500 leading IT professionals joined us in June for the unforgettable. .NEXT Las Vegas conference. Now the only event dedicated to the latest in datacenter and enterprise cloud technologies is coming to Europe for the first time ever. I invite you to be a part of the inaugural .NEXT Europe conference in Vienna, Austria on 8 - 10 November and join dozens of world-class speakers, leading industry experts, like-minded peers and Nutanix executives on the journey to redefine the enterprise datacenter. 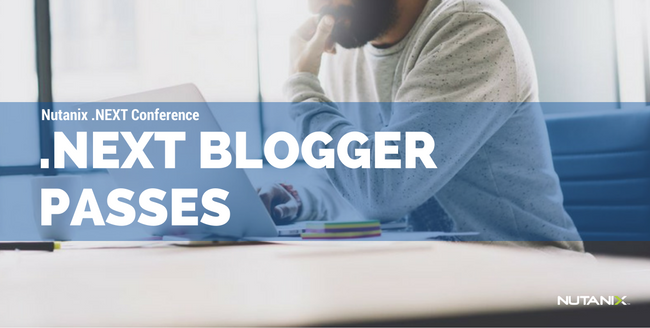 I am delighted to share that this year we have a limited number of blogger passes available for those bloggers that would like to attend .NEXT Europe. The blogger pass provides you with a complimentary conference pass. Our goal is to get as many people from the blogger community to join us for this exciting event in Vienna. If you are interested, take a moment and complete the request form, not everyone will be selected for a pass as we do have a limited number, I look forward to connecting with you in Vienna. To register for a blogger pass please complete this request form.